Walker River Resources Corp. [WRR-TSXV] on Wednesday announced initial results from a late 2018 reverse circulation drill program on the Lapon Canyon Gold Project, which is located about 60 kilometres southeast of Yerington, Nevada. The company said RC hole LC18-29 returned 31.1 g/t gold (uncut) over 13.7 metres, including 198 g/t (uncut) over 1.5 metres and 78.1 g/t (uncut) over 1.5 metres. Walker River advanced on the news, rising 28% or $0.025 to 11.5 cents on volume of almost 5.9 million. The shares had previously been trading in a 52-week range of $0.045 and $0.09. Walker River is a junior mining company with a focus on advancing high-grade, low cost mining opportunities into production. Lapon Cayon is the company’s flagship asset. 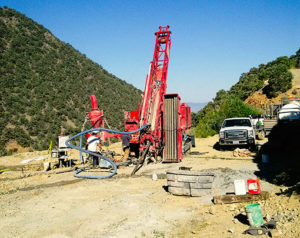 Walker River says the project exhibits the potential for high-grade vein type gold mineralization as evidenced by past underground activities on the property. The Lapon Project consists of 96 claims (1,940 acres) and is situated in the Wassuk Range where it is accessible by State roads. The project is also located within the Walker Lane shear zone, a 100-kilometre-wide structural corridor extending in a southeast direction from Reno, Nevada. It is a trend that plays host to numerous gold, silver and copper mines, notably the Comstock Lode mines in Virginia City. It also hosts the past producing Esmeralda/Aurora gold mine, with reported production of roughly one million ounces, and the Anaconda open mine copper mine in Yerington. Small scale high grade mining began at the Lapon Project in 1914. Approximately 600 metres of drifts and raises were developed from two adits. The property also featured a two-stamp mill. Further underground work was carried out, returning numerous assay values in the range of one ounce per ton, with a sample at the end of an adit returning 20.6 ounces per ton. Additional work on the project in the following years, included the installation of a ball mill and milling facilities. On Wednesday, the company said that to date, mineralization has been discovered in a broad, altered, fractured and brecciated northeast trending structural zone known as the Lapon Rose Zone. Anomalous gold values were denoted in many areas within this zone, and significant higher-grade mineralization over significant widths is located within sub vertical en echelon zones of intense alteration and gold enrichment. In 2018, exploration focused on infill and expansion drilling at the Lapon Rose zone, follow-up drilling at the new discovery in Hole RC 17-19 (which returned 18.6 g/t gold (uncut) over 6.1 metres), as well as drilling other targets, including other fault alteration zones, which in some cases show evidence of previous workings, the company said. The Lapon Rose Zone has now been drilled over a strike length of some 365 metres, over a width exceeding 150 metres and a height of over 200 metres.